Fourside in the Smash series. Unlock criteria Play 100 vs. matches. Fourside (フォーサイド, Fourside) is a stage in Super Smash Bros. Melee and Super Smash Bros. Ultimate. In Melee, it is an unlockable stage, while in Ultimate it (along with all other stages) appears as a starter stage. It is one of Ness's home stages, but Pichu and its teammates are faced here in All-Star Mode. 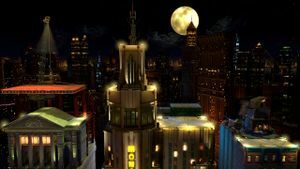 The stage is set on the rooftops of three buildings of the city of Fourside at nighttime, with several more skyscrapers in the far background. Between the buildings there are pits narrow enough to be scalable by wall jumping. The building on the left has a slanted, triangular roof. A crane in its background keeps a floating soft platform suspended over it. Occasionally, the crane activates and moves the platform: it starts almost completely over the roof, then it moves to the left until it is fully over the pit, then slighly upwards, then to the right over the building, then down to its starting position. The skyscraper in the middle, the Monotoli Building, is the largest of the three. A tall spire rises on the left part of its roof: its top is flat, and at about half its height jut out two small ledges. The right part of the roof is a wide flat surface with a helipad in the background: occasionally, a yellow helicopter flies to and from it, with no effect on the fight. The building on the right is the shortest one, and its roof is a simple flat surface. Occasionally, a UFO floats downwards with an eerie noise and remains suspended over either the left or the right part of the stage, serving as a temporary semisoft platform which bobs slightly. Its slippery surface is slightly slanted with a bulge in the middle. Its middle section is directly aligned either with the right pit or the middle of the roof of the left building, depending on its position. Wavedashing on the UFO can provide a major distance boost. After about thirty seconds from its appearance, the UFO starts blinking and quickly disappears into thin air. In Ultimate, however, it has an actual animation, showing it flying away from the stage and into the moon. In Super Smash Bros. Ultimate, the main platform of the Ω form and Battlefield form is reminiscent of the Monotoli Building, such as the floor resembling the rooftop of the building and the walls resembling the building's facade. The platform is the same size and shape as Final Destination and Battlefield, respectively. The actual Monotoli Building and the surrounding buildings are absent and UFOs do not appear. The three soft platforms of the Battlefield form resemble the soft platform the crane supports in the regular form. Fourside as it originally appeared in EarthBound. 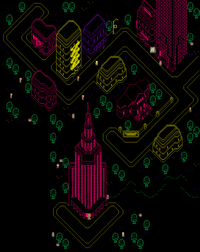 Moonside, as seen in EarthBound. The background music of EarthBound's opening sequence. 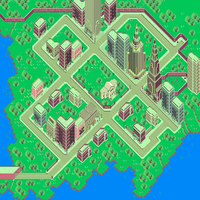 In EarthBound, Fourside is the largest city among the ones visited by Ness on his journey. It has a dark and bizarre parallel version, Moonside, created by the power of the evil Mani-Mani Statue: once the Statue is defeated by Ness and Jeff, Moonside disappears. 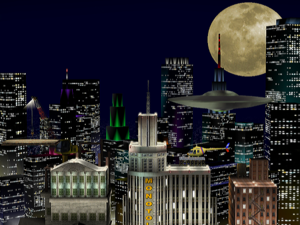 While Fourside is set during the day in EarthBound, it appears at night in Smash, causing it to more closely resemble Moonside's darker color palette; however, it lacks the shining neon lights that make up the majority of color in Moonside. The Monotoli Building is one of the tallest buildings in the city, with a private helipad on its roof. It is the workplace of Fourside's mayor, Geldegarde Monotoli, who—under the influence of the Mani-Mani Statue—keeps Paula prisoner. After Paula is freed, he offers to lend his helicopter to Ness and his friends to help them reach their next location; however, Pokey Minch steals the helicopter and flies away. In Melee, the helicopter has a more realistic appearance; while in Ultimate, it closely resembles its appearance in EarthBound. In both games, the design of the Monotoli Building is different than how it appeared in EarthBound, though it retains the vertical "MONOTOLI" sign on its front. The top of the left building in this stage resembles Fourside's Dinosaur Museum. However, the museum is not a skyscraper in EarthBound and is much farther from the Monotoli Building. The UFO's appearance is based on the ones which appear in the opening sequence of EarthBound, which shows a still image depicting three large flying saucers attacking a small town. The sound which signals the UFO's entrance in Smash originally played during this opening sequence. Large flying saucers make no further appearances in the game; however, smaller UFOs appear as enemies in both EarthBound Beginnings and EarthBound. Fourside is often banned due to the various ways in which players can camp and stall due to the large size and unusual geometry of the stage. The lack of large, flat platforms also hampers fighting between players, particularly in doubles. In addition, the UFO provides a platform that is too close to the upper blast line, thus potentially causing early vertical KOs. The presence of pits between buildings gives relevant advantages to some characters, such as Peach (who can stall indefinitely by using Peach Bomber repeatedly against the walls), while greatly crippling characters with primarily horizontal recoveries, such as Donkey Kong, who are even more susceptible than usual to early KOs from meteor smashes and spikes. The narrow pits also give an advantage to characters capable of wall jumping such as Mario and Captain Falcon and makes recovery almost impossible for Ness should he fall between them due to the wide angle needed for PK Thunder to be used correctly. Isabelle using Balloon Trip on Fourside. Isaac performing the Lift-based Psynergy on the stage. Joker taunting on the stage. Despite its unlockable status, this stage can be seen multiple times in Melee prior to its unlocking: it appears in some characters' Classic Mode endings (such as Captain Falcon) as well as in the Gargantuans event. Additionally, the stage shows up in Captain Falcon's vignette in the Special Movie. In Melee, Computer players on Fourside tend to air dodge to recover instead of using their up special moves, sometimes even self-destructing. Due to its slipperiness mechanic, in Melee, repeatedly wavedashing on the UFO can cause a huge momentum boost, benefiting characters like Peach and Zelda, who both lack a long wavedash. It is possible that Fourside's inclusion as Pichu's home stage in Melee’s All-Star Mode may be a reference to the Pikachu and Pichu short that played before Pokémon 3: The Movie - Spell of the Unown, which took place in a big city. In Super Smash Bros. Ultimate, on the right building there is a clothesline with an orange Hawaiian shirt and sunglasses hanging on it, which resemble the shirt and sunglasses worn by Everdred in EarthBound. In Ultimate, the inside of the Monotoli Building and the buildings right are fully modeled and textured. Fourside briefly appeared in the E3 2018 Direct, and in the background was a skyscraper with the text "Department" going down its facade; in reference to the Grand Department Store in EarthBound. In the final release, the skyscraper is still present; however, the text is absent. This page was last edited on April 16, 2019, at 21:52.